Use the controls above to start the music. Musicians are natural historians; Martin Zavala has demonstrated this for more than 50 years. When my wife Lidia and I stopped to see my grandfather’s (Francisco Salinas) house earlier this year, the first person we saw around the corner from my dad’s house was Martin and his wife Magdalena “Bebe” de cariňo! What began as a 5 minute SALUDO turned into more than an hour of Asherton hospitality; no surprise here! GRACIAS Martin y Bebe! Personally, I have always envied musicians because they have a natural power to tell a story. 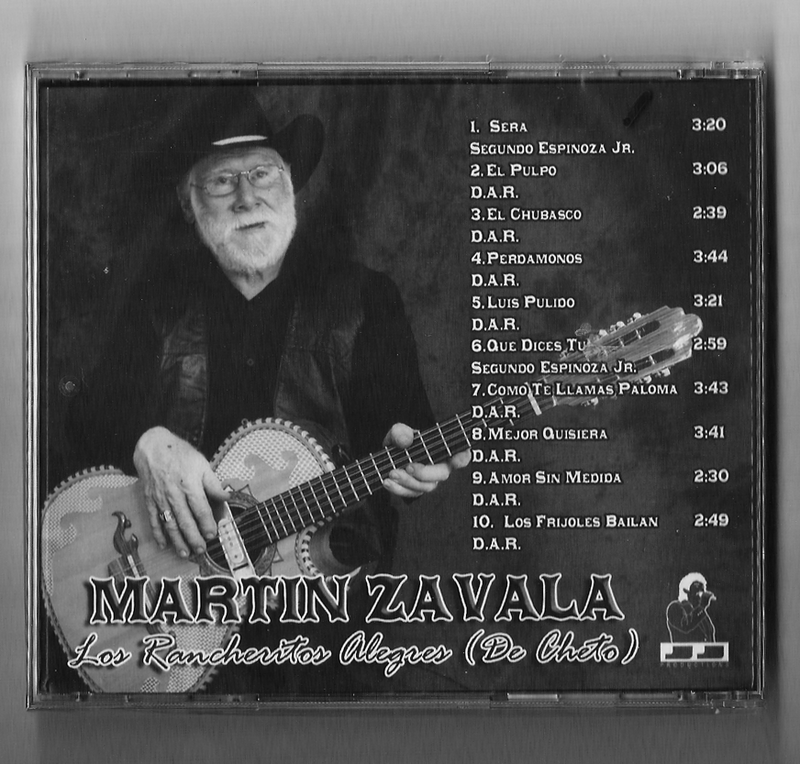 This quality is easy to see in one of Martin’s recent CD “Como te llamas paloma? Which he kindly autographed it to me on May 4, 2013. Besides being an excellent signer who has entertained crowds for more than ½ a century, Martin is also a master at speaking the vernacular known as SPANGLISH…Si Eňor! After a few hours of dialogue within a two day period I got to know Martin well. He is as transparent as the cellophane paper that covers his CD which I enjoy often. More on Martin and “Los Rancheritos Alegres (De Cheto) another day as I am anxious to share the music by a guy who gives it ALL his CORAZON, AMISTAD Y SINCERIDAD! ENJOY ☺ a salud de MARTIN! NOTE: Martin les envía saludes a toda la RAZA de Asherton, Ashinto o Cheto! He plans to come up to Oregon and Washington in July of this year. He also sends his Músico Saludos a los Rebeldes/Hermanos Salinas who themselves have entertained la RAZA de Oregon for more than 50 years! A story of Tejano Music and the PUENTE MUSICAL between Asherton and Marion County, Oregon will be shared with you later. 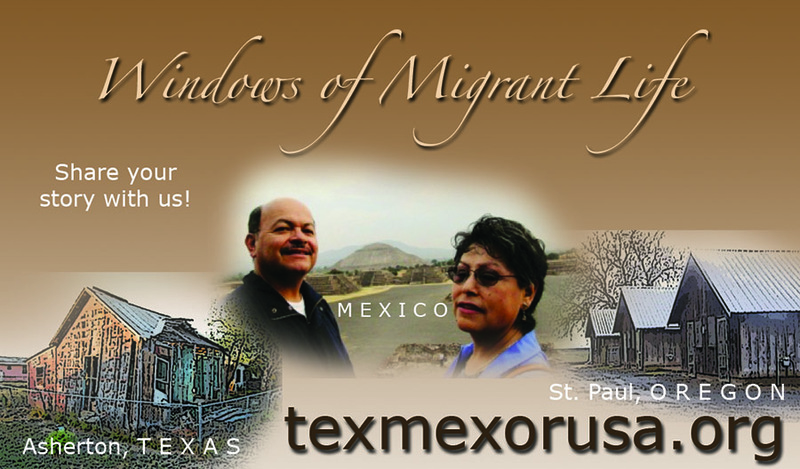 My wife Lidia and I are privileged to have the time, information and resources to share with the community. PLEASE understand that this is a work in progress and that we only have 1% of the information posted. Mathematically it is likely that this project will never be finished as the information is vast and realistically my time and ability is predictably limited. Si DIOS me da el tiempo y la SALUD hare lo posible por llegar cerca a la meta; que al momento es la INFINIDAD! CONTACT I greatly appreciate your comments, suggestions, or critiques of what you see or don’t see. ALSO FOR YOUR INFORMATION: The priority for inclusion is those families who came before 1960. These families I regard as “Pioneros de Oregon” a topic which is covered extensively throughout the website. USE THE CONTACT page so we can gauge our inclusion. If you know families who arrived to the Marion County Area before 1960 and whose last name is not included, we gladly appreciate your contact information so we may follow up and get the details necessary so we can include them. WITHOUT YOU…THE STORY WILL NOT BE COMPLETE!